On Saturday, December 21st, at the Hammer, Los Angeles is a performance in conjunction with Kelly Nipper‘s “Black Forest”. There will be 11 performances total by the dancer Marissa Ruazol. Taking place in the gallery among the artworks, the performances are rooted in a system of movement description called Laban Movement Analysis. Laban’s method provides a vocabulary and a conceptual framework for investigating and understanding time, space, and motion as primary materials. In “Black Forest”, the Los Angeles-based artist Kelly Nipper has created an environment equally informed by mythology and reality, by history and the present, by movement and objects. The project is inspired in part by the Black Forest—a wooded mountain range in Germany that has spawned legends featuring clairvoyants, magicians, sorcerers, and witches but is perhaps best known for clock making and intricately decorative wood carving. 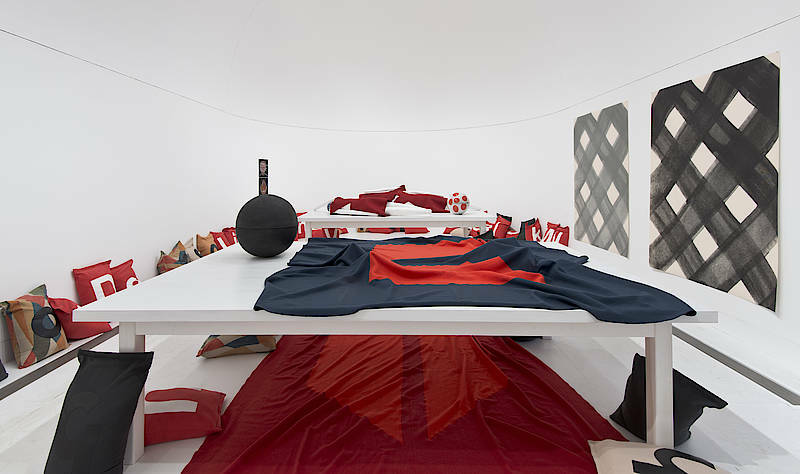 The installation is a landscape of sorts, filled with a variety of objects arranged on tables, resting on the floor, and leaning against or pinned to the walls. Performance: Saturday December 21st, 2013. 2pm. Next post SFAQ Pick: "The First Family" solo exhibition by Monir Farmanfarmaian at Haines Gallery, San Francisco. Previous post SFAQ Pick: “Chris Burden: Extreme Measures” survey exhibition at the New Museum, New York.